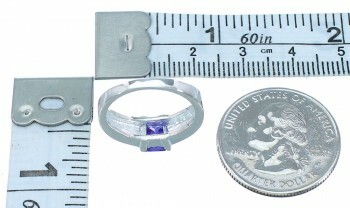 Sterling silver, man made Blue Opal, Amethyst, and Cubic Zirconia. There is nothing at all average about this beautiful ring! 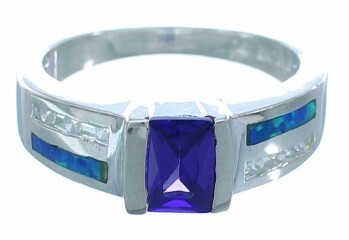 This piece of jewelry is crafted out of genuine sterling silver, along with man made Blue Opal inlay, Amethyst, and Cubic Zirconia stones. 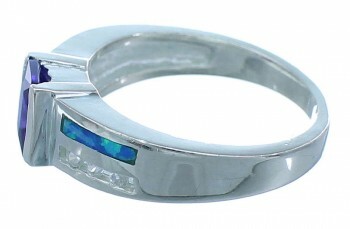 The inlay is carefully set, while creating a beautiful design for a stunning look. The ring has ONE Amethyst and SIX Cubic Zirconia stones that are carefully placed in silver bezel settings for a dazzling finish. 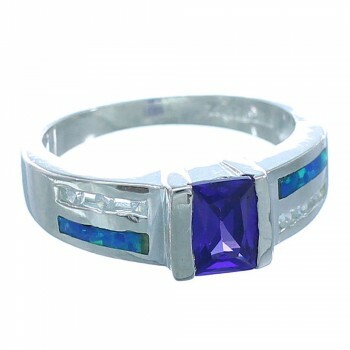 Ring is stamped sterling silver and hallmarked. Amethyst is the birthstone of February, it is a very spiritual crystal, it increases psychic ability and opens you to higher knowledge. It is also known to be calming, sobering, and helps to eliminate bad habits and acquire good ones.